Any grad of Miami University or of Ohio University knows the rivalry between the two is brutal. 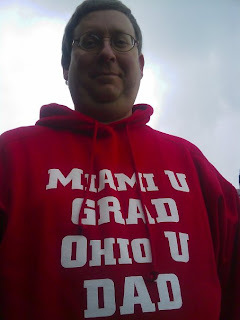 I got this sweatshirt, a gift from my daughter who attends O.U., to wear when I attended the M.U. v. O.U. game in Athens this past football season. O.U. won that day and the sweatshirt, needless to say, didn't make me popular. O.U. won for only the second time in its history in the NCAA tournament. As their second-round game is underway, I'm professing that I'm proud, as an Ohioan, to cheer on Ohio University as far as their talent and luck will take them. This time, Go Bobcats!